1. Batman: Ten Nights of the Beast by Jim Starlin & Jim Aparo. First off, how are you not going to pick up a comic with a cover like this? This brutal story’s about a leather daddy Russian assassin who terrorizes Gotham City up until the Steve Ditko-influenced conclusion. Told in a quasi noir voice, it’s pretty weird that I liked Starlin’s humorless crime writing style considering how much I don’t care for his usual cosmic scripting. 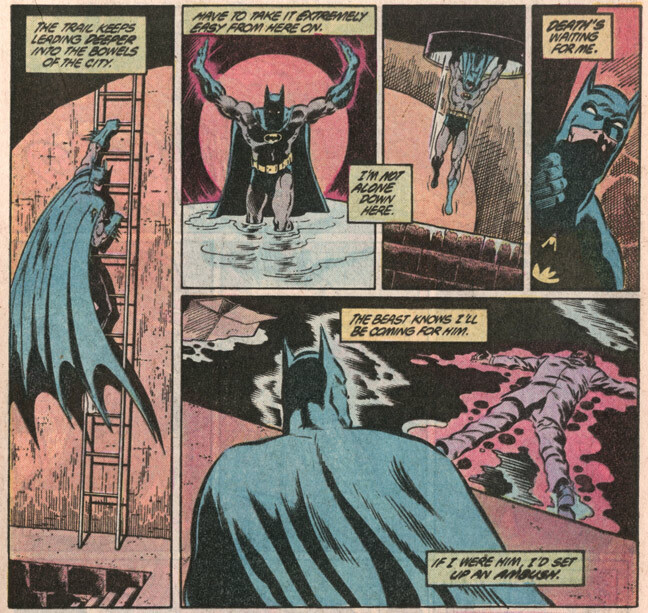 Jim Aparo, as always, makes it all worth it by simply being the best Batman artist in the history of the entire world. Aparo being his own best inker, I’m also surprised to notice how well his style worked with Mike DeCarlo’s inking. So yeah, this held up as a solid, entertaining read. Screw that rubber suited goofball who can’t decide whether he’s dead or not. THIS is Batman Comics. 2. Manhunter by Archie Goodwin & Walter Simonson. Manhunter will always be awesome. You don’t need me to tell you that. 3. Pirate Corp$! by Evan Dorkin, the Slave Labor issues. 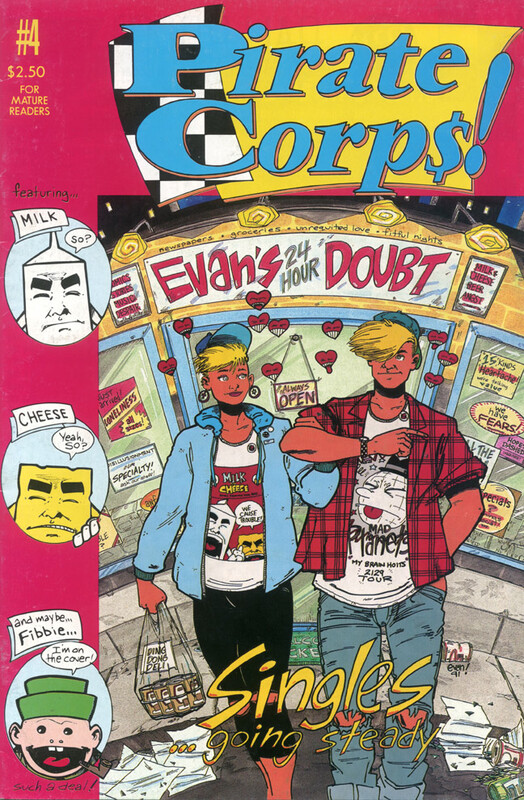 Evan Dorkin’s Pirate Corp$! was one of the handful of comics that got me excited about comics again after I had left them in adolescent disgust. This issue in particular was the sort of thing I would’ve missed as I was trying to learn how to draw back muscles by tracing Whilce Portacio, but the timing was perfect by the time I actually saw this PC$! cover. It’s about a young guy (Halby) pining for a girl (Elsie) and all of his hilarious anxieties, every psychological detail crammed into every page. PC$! 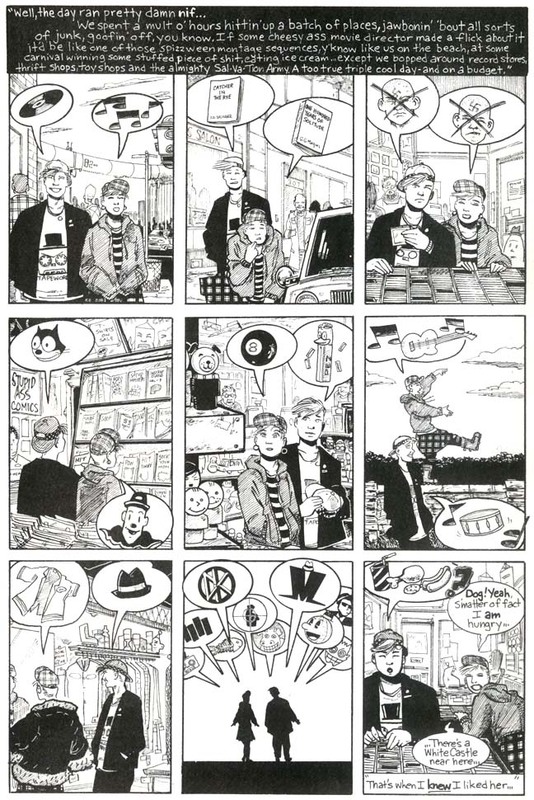 #4 marks the first time I ever read a one-man anthology and I instantly fell in love with the format: it had one pagers, obscure pin ups and stories, a fun letters page, and a two page editorial where Evan talked about all sorts of music & movies. That kind of personalized immediacy is now called the Internet, but nothing matches the feeling of thinking there was a comic made just for you, all done by one guy and a pen. 4. Robocop vs. Terminator by Frank Miller & Walt Simonson. This one’s the stinky one, sis. Although Simonson can hardly do any wrong in my eyes (see my critical analysis of #2 on this list), this comic falls under the “post-monthly grind” era of his career. Easy to spot are the Miller cliches: the killer deadly child, the gang of toughs holding someone hostage, an amplified resurrection, and lots o’ guns. It had its moments, but it wasn’t exploitative or ridiculous enough, definitely not as gruesome as the source material. It’s still fun to look at how many speed lines Walt could fit into a page. All in all, not the fave it used to be. 5. 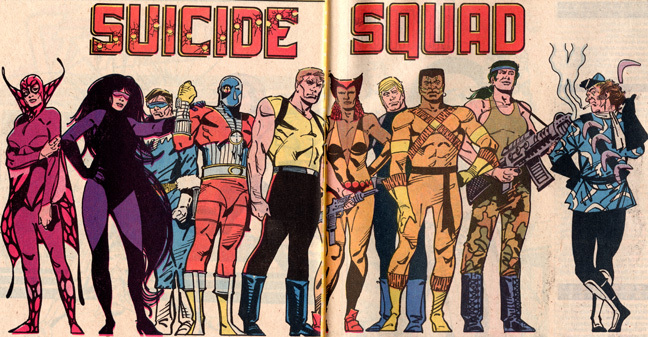 Suicide Squad, John Ostrander’s 80s/90s work. Then there’s Suicide Squad. The high concept is the Dirty Dozen with super villains, which could’ve been just another dopey opportunity to re-license characters, but John Ostrander made it one of the most interesting character studies in mainstream comics. It’s a super powered adventure series above and beyond all else, but the personal touches that Ostrander peppered all throughout the series are what makes this title worthy of some examination. 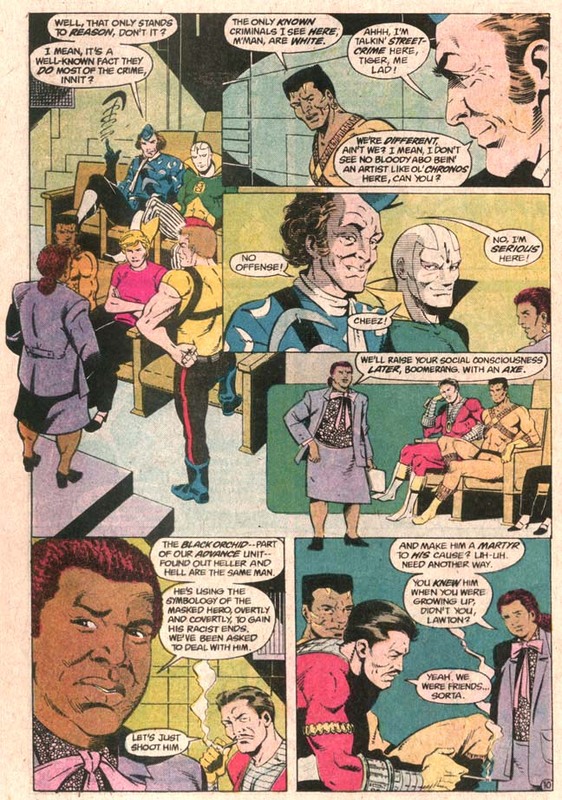 The central figure throughout the title’s run is Amanda Waller who happens to be the most well defined personality DC has under its wing. While everyone was running around with clenched teeth and a badass attitude, Waller came across as a fully formed force of nature. 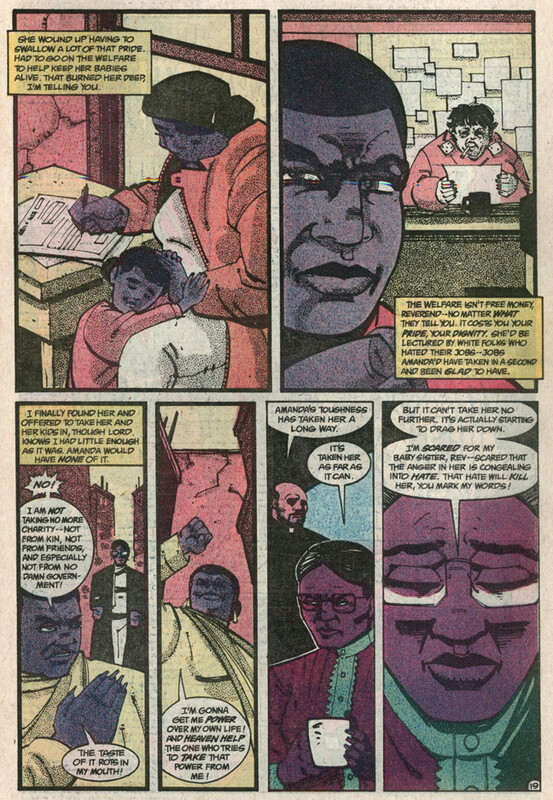 While writers sometimes make it obvious that they don’t have the world view to back up their ideas, Ostrander dealt with class issues and race semi frequently without veering into soapbox, insensitivity or parody. I’m not suggesting a writer needs to cash welfare checks to tell a story about the poor with accuracy, or that writers need to shoot a person to write a crime story with any sort of command, but Ostrander touched upon the subject with considerable maturity. There’s plenty of great action, back biting, bloodshed, political intrigue, and slugfests crammed within 66 issues, an annual, and a mini series. The level of consistent quality is a feat in itself, and the artist I associate with most of these comics is Luke McDonnell. There’s something a bit awkward in his overall approach to drawing, but it really adds to the mood of the series in a way that any other polished or self conscious style wouldn’t. 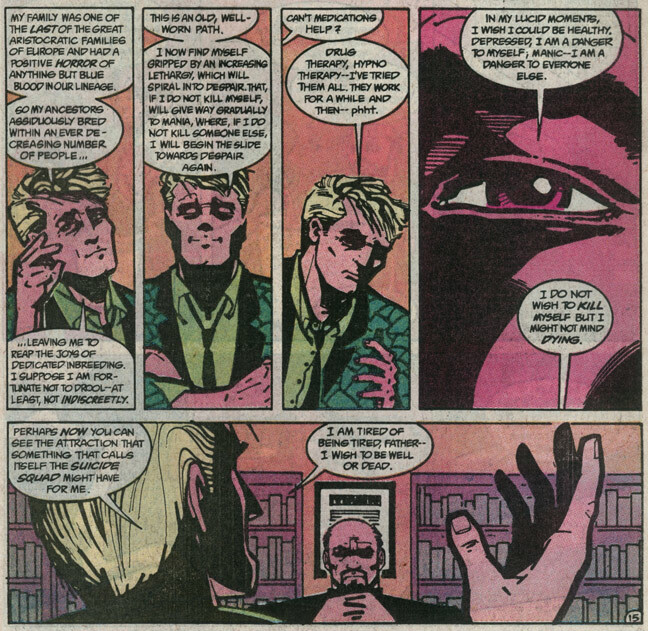 While Deadshot is the other pivotal character in the book other than Amanda Waller, an unlikely mascot for supplanted characterization is Count Vertigo. The Count’s role plays a good counterpoint to the rest of the book, but it’s his finale that gets me every time. The final scene of the entire run is possibly one of my favorite endings of a comic series, but why ruin it for you? Here’s a little therapy session, instead. And they had Shade as a member! Not the milquetoast poet that’s currently being dredged up… I’m talking about the real deal SHADE! C’mon, any team that would have Ditko’s Shade the Changing Man as a member is OK in my book. If I were you, I’d order the first 37 issues for dirt cheap and get hooked on these stories. But if you care about glossy paper and book spines, DC recently reprinted the first eight issues (with the odd inclusion of a totally unnecessary Secret Origins story), so go to your nearest comic shop and get it. Out of all the comics I’ve revisited throughout the years in order to find out if they’ve held up or not, Suicide Squad consistently gets better and better. Again you’re from a different era and I read none of these except Pirate Corp, as I used to get them for free in the mail (yes, Evan you made me laugh) when it was published by Malibu-Eternity comics! 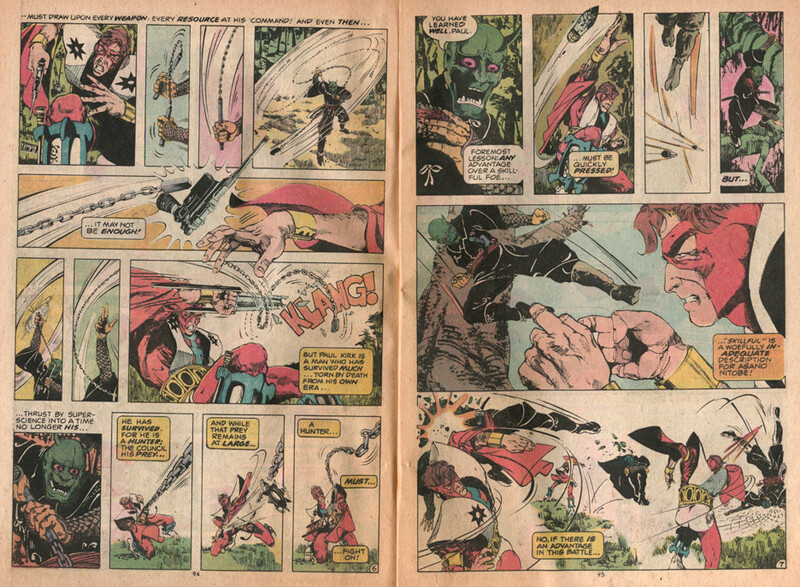 I know Man Hunter is great but I never got my hands on any reprints. Although I haven’t read it SINCE I was a kid, I suspect Tomb of Dracula to be the only book that could stand the test of time for me. I remember that book (story AND art) blew my 11-12 year old mind when I got a bunch at a rummage sale. Timbone, these comics span 2 and half decades… that’s a long time for a Marvel Zombie like yourself to not read comics! 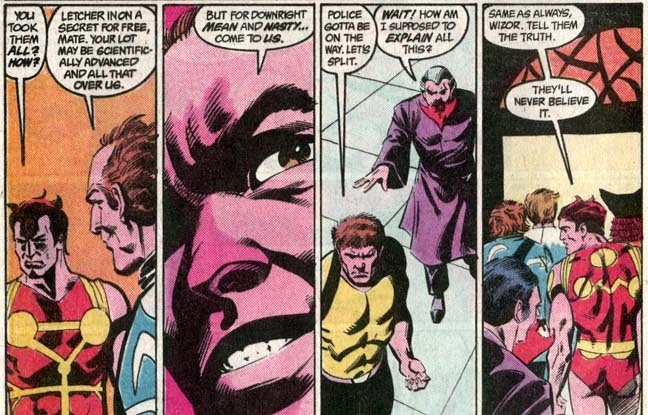 The Manhunter run was a little before my time, but I was lucky enough to have an older relative give me a couple of the Detective issues they appeared in. 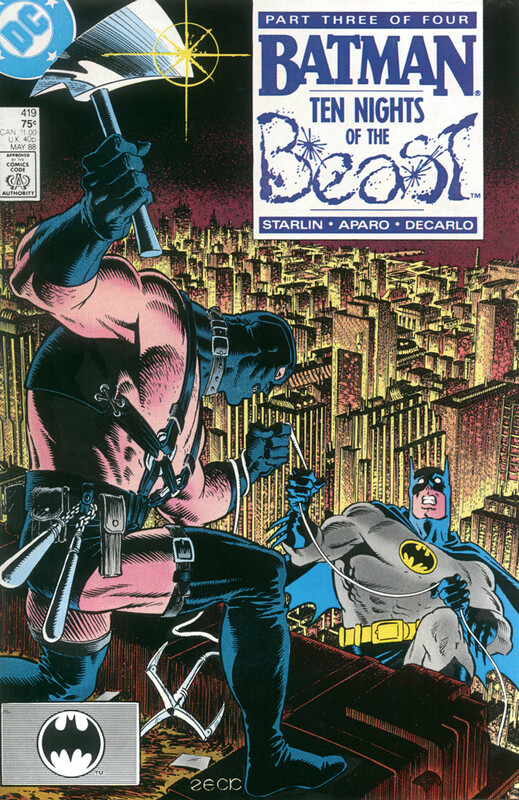 TEN NIGHTS – As you and I have discussed elsewhere, Aparo and DeCarlo really settled into a sweet spot for the Batman title for about a year. I totally agree that Aparo was his own best inker (see all of Aparo’s 70s DC output and Batman & The Outsiders in the early 80s). But for some reason, DeCarlo brought a dependable slickness to Aparo’s work. I always seemingly forget that Starlin wrote this and ‘Death In The Family’. I think I’ve been conditioned to see Starlin as ‘Mr. Cosmic’. However, Starlin writes some really cool scenarios in ‘Ten Nights’ (the elevator scene and subsequent rooftop chase are extremely memorable). 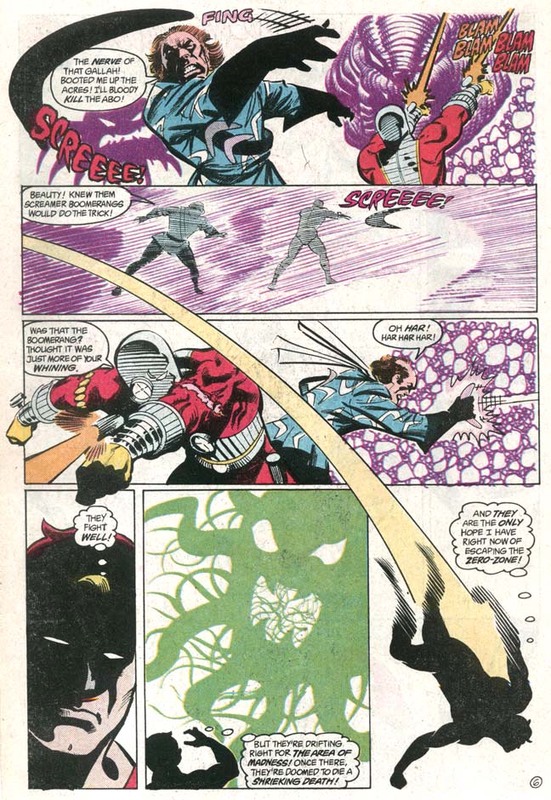 MANHUNTER – I’m kind of partial to that early scratchy Simonson plus the storytelling and design are already in place. Great read! For the poster above who could not find the reprints, hunt either the 1984 one-shot or the more expensive Special Edition. And truly, you can find either for super-cheap. ROBOCOP VS. TERMINATOR – I haven’t read it a few years myself, but I remember it being a cool romp. Simonson, fully formed into his angular rock-solid aesthetic was the perfect choice for this. Though the Miller-isms are live and in full effect, I thought the ending was pretty cool and unlike Miller for once. 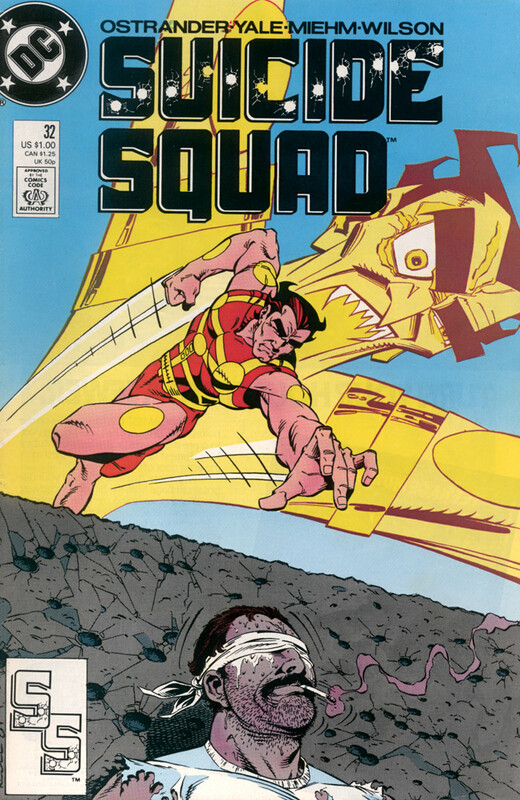 SUICIDE SQUAD – I have danced around this series for years in the back issue bins. Got issue 1, but then DC announced a Showcase Presents volume. Then they unannounced and I was playing wait and see before recommencing collecting the series for the cheap bins. Michel, you beg a great point about Luke McDonnell. In fact, I’ll expand to many of the series that DC put out for most of the 1980s. The key formula for most of those books was having a dependable artist like McDonnell who could storytell and not over-power the scripting. Also, the scripting then seemed more grounded and willing to develop a cast than perpetually high-concept/Big Ideas as a umbrella for the cast to quip/snipe at each other for no reason. I suspect that I would like Aparo Batman, most of the modern post-dark-knight stuff leaves me cold. 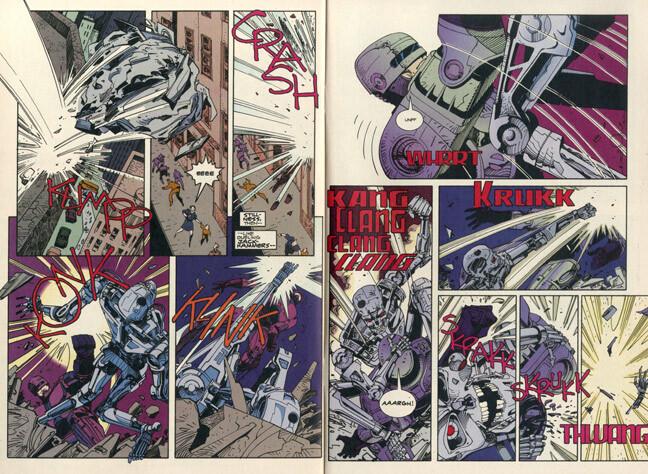 You can learn everything you need to know about drawing action in comics from Miller & Simonsons Terminator/Robocop. I know I did. Ostrander is one of those writers who I am ashamed to have not followed religiously ever since. The Suicide Squad came out at the same time as the Giffen/DeMattheis/Mcguire JLA and it was like that books dark shadow. Just as good, buy not as influential for some reason. I’m buying the collections right now because it deserves a place on my shelf. I liked Mcdonnels art too, it really came together in the Deadshot mini series where he inked himself. 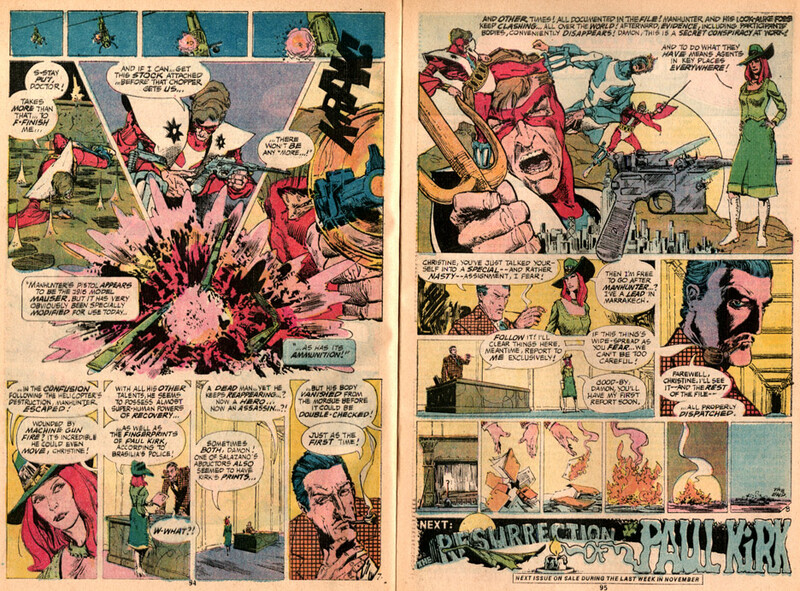 Another great blog post Fiffe. As a 40+ year old, I remember all of these comics well- most of them fondly. Thanks for bringing them into a new “auteur/Cahiers du Cinéma ” light!